Debating is just one of many extra-curricular activities which Daramalan offers within its educational program. In terms of the educational process it must be considered one of the best as it promotes many competencies which are essential to lifelong learning. Some of these skills are the skills of public speaking and persuasion, analysing a proposition and developing arguments both in favour and against, the exploitation and expansion of one’s general knowledge, especially of current affairs, constructing those arguments into a coherent speech, working as a member of a team and actively listening to another speaker. The common question we get is: What is mooting? Mooting is legal argument on a point of law before a judge, and requires advocates to demonstrate deep knowledge of the case and the law, court etiquette and an ability to answer difficult questions posed by the judge. Mooting is challenging, even for seasoned lawyers. If you visit the High Court and watch a case, it will give you an idea of the knowledge and skill the students have to demonstrate. 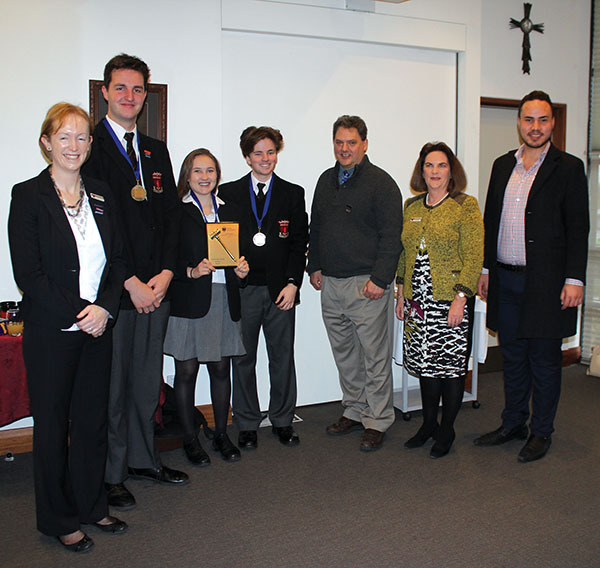 In 2016, Daramalan mooters Kate Feltrin (Senior Counsel), Jacob Howland (Junior Counsel) and Nathan Hughes (Instructing Solicitor), won the Canberra Region of the Bond University High School Mooting Competition. This is the fourth year in a row that Daramalan College has taken out this title. Both Kate and Jacob also received Highly Commended Advocate awards in recognition of the high standard of advocacy skills they displayed on the day. Not only did the team win the Canberra Region title, they also qualified to compete in the Finals at Bond University at the Gold Coast. This was an outstanding achievement as only eight teams from around Australia qualified for the finals. The Bond University Mooting competition enables Legal Studies students to engage in legal advocacy, which is what lawyers do in practice. It is a wonderful opportunity and the team’s performance was a magnificent achievement. Students have the opportunity to compete in the Capital Region Mock Trial Competition. The competition, which has been running since 2007, provides secondary school students with the opportunity to experience real-life court trial settings. Students competing will have the chance to play the role of prosecutor, barrister, solicitor or witness in an imaginary legal matter. Each school takes a side in the case – one for the Plaintiff/Prosecution and one for the Defence – in front of a mock trial judge. The matter may be a criminal matter or a civil matter. The competition involves three general rounds, a semi-final and a final, which gives students a chance to play a variety of roles if they wish. The competition is generally held in August and September of each year and is open to Year 11 and 12 students. The competition is designed to offer students an enjoyable introduction to law. The framework provides an introduction to university and law school, as well as to the legal profession. Daramalan College has participated in the competition since 2014.